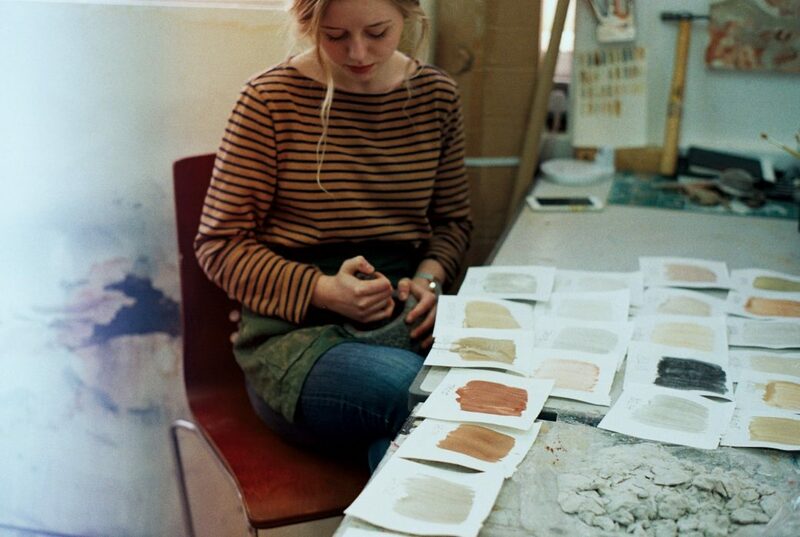 If there’s anyone who fits the profile of ‘One to Watch,’ it’s young British talent Emily Tapp. Boasting a wholly original technique and determined body of work, it’s easy to see how the Cornwall-based artist snapped up studio funding and speedy representation on the heels of her degree show last year. From strong coffee to start the day and cosy cooking to end it, discover how Emily Tapp navigates a day spent stitching together stories and pushing paintings beyond their traditional formats. Good morning, Emily! What’s the first thing you do when you wake up in the morning? Drink coffee – normally whilst half asleep! My partner is a coffee roaster and so the ritual of drinking coffee is important in our household! We own a few special ceramic pieces from various artists we both admire, and it is a beautifully meditative way to start the day. We commute to work together, usually arriving at my studio at around 8.30am. I then spend 30 minutes or so looking over my to-do list I had written the previous day, note down any other things I can think of, reply to any emails or messages and then settle down to some work. I actually only get to create 3 days of the week. I am a young artist and I graduated last year, so am still working part-time in order to be able to support myself, stay in Cornwall and sustain my practice. I would say I am inspired every day of the week, always thinking about my work, but given that I only have three of those days to actually make art, they are sacred. I try to be very organised, writing lists of ideas in moments of inspiration, so I can make the most of my studio time. My work is inspired by landscape, the earth and traditional craft techniques, but I would say that personally I am inspired to create out of the sheer joy it brings me and the necessity to see my ideas through to the end. I am lucky enough to be working in a private studio at a complex of workspaces called CAST in Cornwall. I have had the first 11 months of my studio lease funded by a Cornwall-based arts funding body called Cultivator, which was awarded to me off the back of my degree show. I have 6 months left in this space now and although I’m not sure where I’ll go next after CAST – studios in Cornwall are in very high demand – I’m trying to get the most out of this amazing opportunity given to me. It’s so hard for young artists to keep creating after university due to time, space and money constraints; I feel like I’ve been given a helping hand to start up, which I am so grateful for. 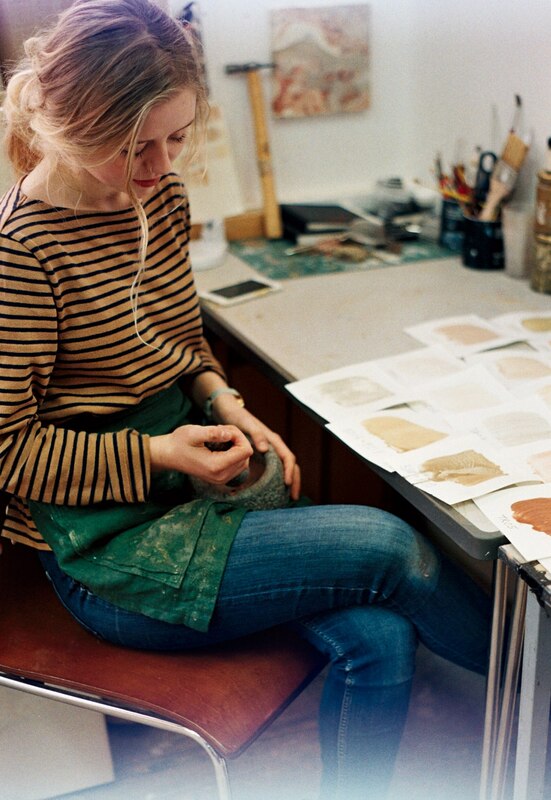 Emily Tapp in the studio. 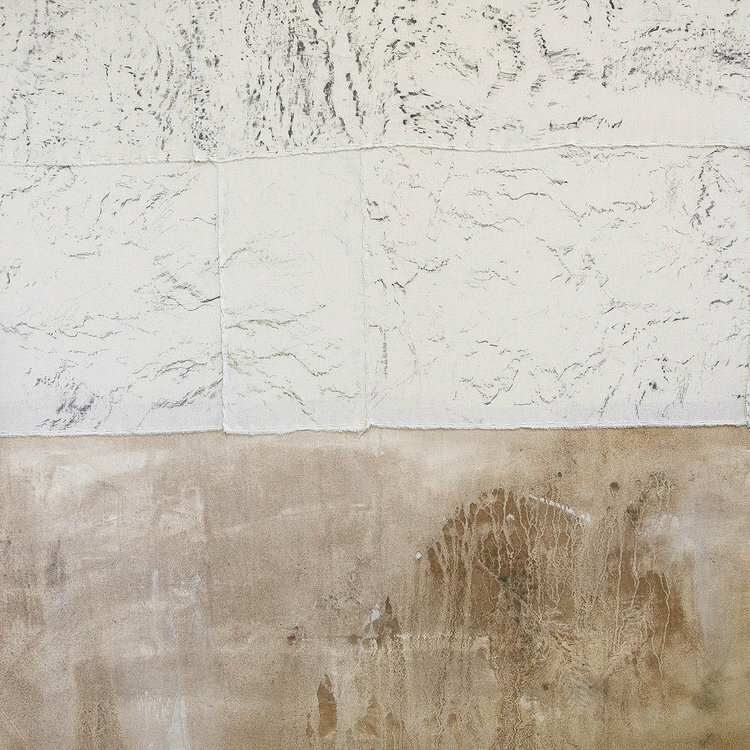 All my work starts as raw canvas, linen or recycled textiles which then undergo the process of dyeing or staining, using natural dyes and earth pigments I’ve collected and processed by hand in the studio. With these elements I compose pieces on the floor, until the work is sewn together and then stretched over a wooden frame. I used to call these works “paintings” despite the fact there was no painting involved. I’m still searching for the right name for the works but for now I’m referring to them as “textile panels.” My work is driven by traditional craft techniques like sewing and mending, and the sewn nature of the work hints at this. I work in a cold studio in an old granite, unheated school building in Cornwall, so the first thing I do when I get in is switch on my electric heater! I’d say that’s my most unglamorous but necessary studio ritual. Other than that, I light incense at least once a day in a ceramic incense stick holder I made for myself, and I’ve actually gotten into the habit of working in silence. I used to listen to music or podcasts but for some reason, over the past couple of months I have preferred to keep my mind focused on the task at hand, with little distraction. Emily Tapp, ‘Abercorris’ 2017. 86x86cm, Embroidery, Cotton on Canvas, Wood. I never do! Quite often, because of the way I work, I never really know how the piece will look until it’s stretched over a frame. There is a lot of unpicking and de-stapling that goes on. Sometimes, the work just looks right. Sometimes I’m not quite sure if the composition works, but I sit with it hanging on the wall for a few days and grow fond of it. Cooking has always been a way for me to unwind after work and after a day in the studio it’s no different. Photographing food and developing recipes was my first job as a young creative, and although I don’t make money from that field anymore, the joy of cooking, preparing a meal and presenting it beautifully is something that helps me to unwind. Emily Tapp, ‘A Tir (Of Land) #5’ 2018. 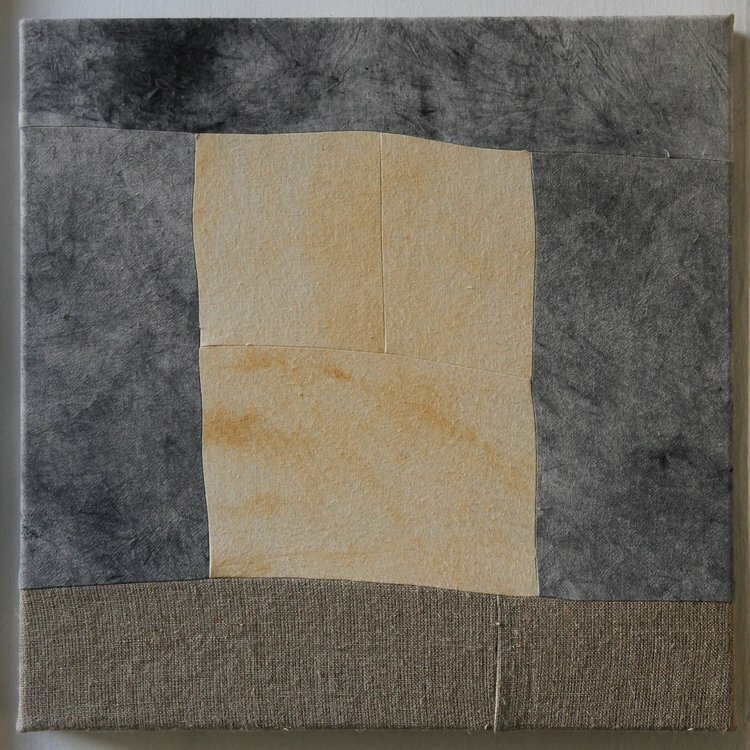 38x38cm, Collage, Embroidery, Earth, Pigments, Cotton on Canvas. What’s your overall favourite aspect of the creative process? Running fabric, both old and new, dyed and undyed, through my sewing machine. There’s something meditative about seeing fabric slip through, turning nothing into something. Also – holding open the seam after I have sewn two pieces together, that’s always magical too. In that moment, I get a glimpse of what the finished piece is going to look like. The work begins to piece together and starts to make sense. Take a look at Emily Tapp’s exciting body of work.